The Business Impact Award Goes To…………. 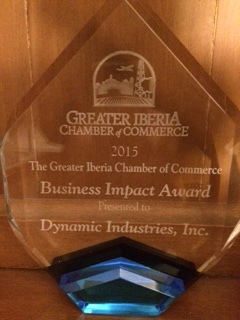 On Thursday, January 21, 2016, the Greater Iberia Chamber of Commerce honored Dynamic Industries, Inc. as a recipient of its Business Impact Award. 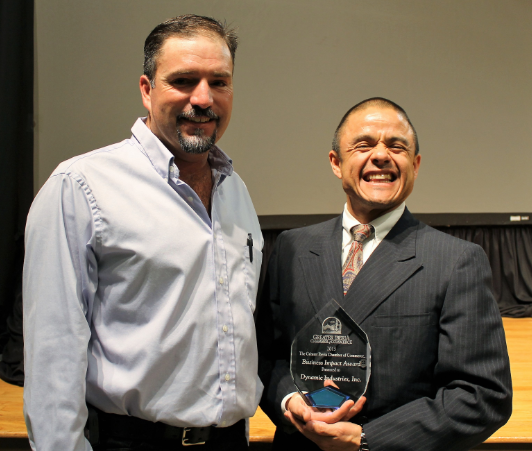 The award was presented during the Chamber’s Annual Banquet held at the Cade Community Center in Cade, LA. A small and a large business from Iberia Parish, LA, were honored during this evening. In attendance at the banquet on behalf of Dynamic were Ricky Bertrand (Construction Superintendent), Chris Gary (SH&E Coordinator), Matt Hebert (Purchasing Manager) and Axel Vásquez (Corporate HR Director). 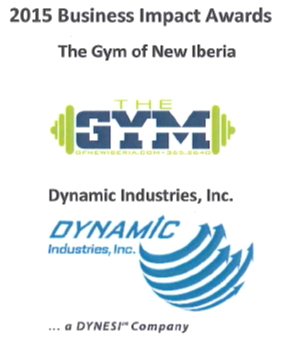 Dynamic Industries, Inc. was honored for its impact at the Port of Iberia. A short video (http://iberiachamber.org/localawards), showing the success and importance of Dynamic in Iberia Parish, was played before the award was presented. Axel Vásquez accepted the award on behalf of Dynamic. The Business Impact Award is bestowed upon an Iberia Parish business that recognizes and promotes the community’s culture of innovation and entrepreneurism. This award also celebrates the business success of Iberia Parish. Criteria for this award includes outstanding business development in growth and/or expansion, product and/or service diversification and/or innovation.